I’m highlighting this poster for two reasons. First, I have really liked director Kim Ki-duk’s films in the past and everything about his new movie seems to get me excited. Second, I really like the simple, clean and yet evocative design. Jin wakes up from a nightmare of a traffic accident on the way to his ex-girlfriend’s home. The dream drives him to the very spot and stumbles upon an aftermath of an accident which unfolded in the same way as his dream. The police track down the assailant and and Jin follows them to the suspect’s home and meets a woman named Ran. She denies the hit and run accusation since she was asleep the entire night. Jin explains his dream to the police and asks to be charged instead. The police dismiss him as a nut and arrest Ran. Jin is wholly convinced that there’s an unexplainable connection between him and Ran. He soon discovers that when he dreams, Ran unconsciously acts out his dream while sleepwalking … Essentially, the two become one. 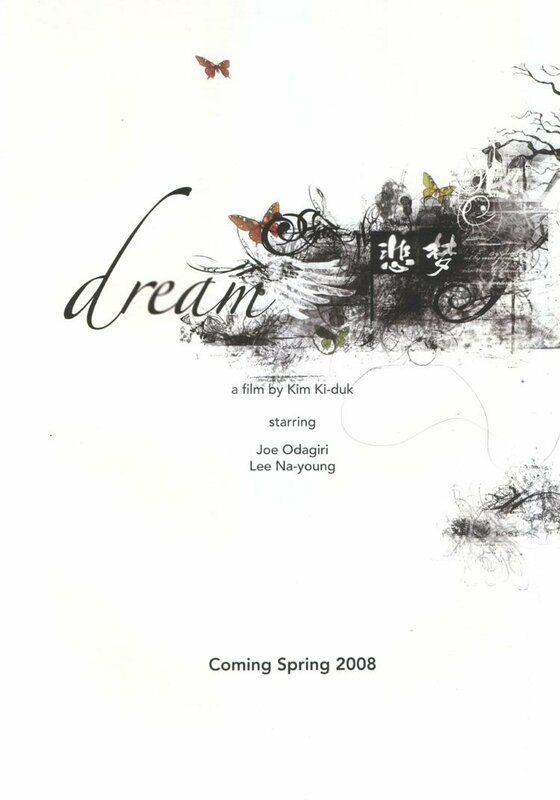 The poster above doesn’t really pay much attention to the intricacies of the storyline, focusing instead on the fact that it involves dreams and in the general surrealism of the premise. In that way it doesn’t really try to convey a plot or an idea as much as it tries to convey a mood and a state of mind. And it does that with a minimalistic design that is mostly just a sea of peaceful white with a few dream like illustrations and blots done mostly in black. Reactions will vary, but for me just seeing this poster immediately gets me ready (and willing) to experience an ethereal, not necessarily entirely logical story that takes me to some unexpected places. The poster also seems to complement my general feelings towards Kim Ki-duk in that it reminds me of the aspects of his work that I have most liked. The poster below, on the other hand, is basically an attempt to tell what the film is about, focusing on the relationship between the two main characters. I think it’s successful in what it sets to achieve, but it’s also kind of dull, not as evocative or beautiful as the poster above.